Dunya Mikhail is an Iraqi-American poet who teaches in Michigan. She has published five books in Arabic and two in English. Poet Dunya Mikhail fled her homeland, Iraq, a few years after the first Gulf War. 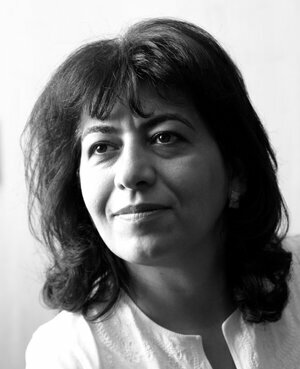 She had been questioned by Saddam Hussein’s government, and state media had labeled her writing and poetry subversive. Mikhail escaped to Jordan and eventually reached the United States, where she made a home for herself — marrying, raising a daughter and becoming a U.S. citizen. Mikhail never physically returned to Iraq. But she revisits her homeland again and again in her poetry — line by line, stanza by stanza. Ten years after the start of the Iraq War, Mikhail joins NPR’s Renee Montagne to read some of her poetry, talk about the bond she still feels with Iraq, and explain why she’s never gone back. “The way that things come to mind, I feel that they are more as fragments. They are strange. They don’t come in order any more, so the happy moments and the sad moments climb over each other: our home in Baghdad with the roof where we would sleep [during] summer nights and we would go down when we [heard] the sound of the siren; the simple heater in the middle of our living room that was called Aladdin, and, on it, that pot of tea with cardamom. Dunya Mikhail remembers this as the first poem she wrote after arriving in the U.S. This excerpt describes a family tragedy; the kidnapped niece was never found. This poem will appear in The Iraqi Nights, a collection Mikhail plans to publish in 2014. “A lot of people ask me this, and the way I feel towards this is really strange. I feel that I woke up from a dream, and going back to Iraq is like asking me will I see the same dream if I go back to sleep? It’s strange. Yesterday I lost a country. like a broken branch from a forgetful tree. of new immigrants in America. return it to me, please. when I lost it yesterday. “I Was in a Hurry” by Dunya Mikhail, translated by Elizabeth Winslow, from The War Works Hard, copyright 1993, 1997, 2000, 2005 by Dunya Mikhail. Reprinted by permission of New Directions Publishing Corp.
Mazin bends his head to the table and cries. His niece in Baghdad has been kidnapped. from her mother’s outstretched hands. into a car. They were like a tsunami. Iraq is a tsunami in slow motion. and if she is what her life is like. Can only be a nightmare. from amputated fingers in the sand. and mixes them with the new ones. a thousand and one nights. I will never smell again. “Excerpt” by Dunya Mikhail, translated by Elizabeth Winslow, from Diary of a Wave Outside the Sea, copyright 1995 by Dunya Mikhail. Reprinted by permission of New Directions Publishing Corp.
our sorrow would have a beginning and an end. and we would be equal. “The Shape of the World” by Dunya Mikhail from The Iraqi Nights forthcoming from New Directions, copyright 2013 by Dunya Mikhail. Reprinted by permission of New Directions Publishing Corp.